The obliquely named Fountains of Wayne is not just a fictional Sopranos scenic backdrop or 1990s power pop band. It is a real place where you can shop for real outdoor cement fountains, and it is an enduring fixture in northern New Jersey. Its surrounding assemblage of faux Roman statues and gaudy bird baths stand along an overburdened highway, where the locals usually drive as if they are fleeing a nuclear attack. Fountains of Wayne turns the tourism timetable upside down. Unlike most attractions, the best time to visit this place is in the late fall and early winter, when the fountain season has ended and the place goes into Grand Christmas Emporium mode. A large Santa waves from the roadside. The store's lower galleries fairly groan with Christmas ornaments, lighting, artificial trees -- all the decorative dust-collectors required for an enjoyable holiday. Yes, we know -- this scene is repeated in nearly every town worthy of a plastic Nativity scene. It's on the second floor that Fountains of Wayne's sled pulls away from the pack. You ascend a staircase crowded by Santa figurines, illuminated cotton clouds supporting rows of angels, and a chubby Pizza chef statue. It's the Fabulous Christmas Spectacular! -- a mix of Christianity, pop culture, slowly creaking mechanical dolls, and New Jersey motifs. It makes perfect sense to the predominantly local visitors, who are invited to take the free tour by signs in both Spanish and English. 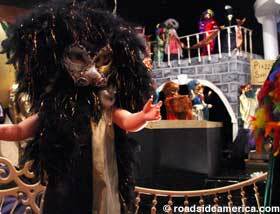 Christmas in Venice:Scores of dolls dressed for a Masque of the Red Death-style carnival, perched on gondolas and canal overpasses. The dolls do not sing, hence the tableau is not as disturbing as Disney's classic of childhood sensory abuse, It's a Small World. Heroes of the World Trade Center attack. Santa under the sea: A claustrophobic "under water" scene that visitors view through an aquarium for the proper wiggly optics. The suspended fish, mermaids, and snorkeling St. Nick are somehow reminiscent of the Sponge Museum, Tarpon Springs, FL, and its perils of the deep. A Grateful Celebration of Heroism: Saluting the brave firemen, police, emergency and rescue workers (and dogs) of September 11, 2001. Signs remind us that "We shall rise again!" and we are "One nation Under God." Small section of the Canine beauty salon scene. Canine Curlie's & Beastly Beautie's Salon:One of the real labors of love this season, a pet beauty parlor mobbed with permed pups and manicured mammals. 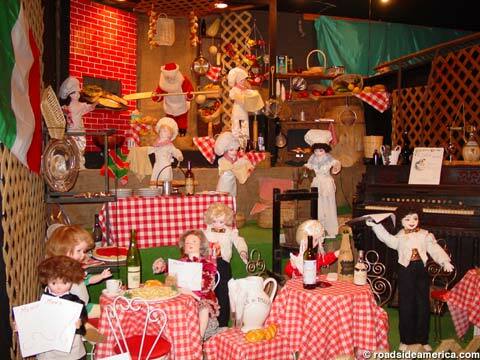 Santa's Pizzeria: One of many multi-tiered displays, with the Jolly One working the ovens. North Jersey must have more pizzerias per person than any other spot on earth. There are many more displays, including a construction site, Santa and creepy dolls astride Harley motorcycles, and a traditional Holy Family arrangement. Judging by the display signs, and some free brochures at the entrance, Fountains of Wayne is managed by pious folk who know the true meaning of Christmas -- and also know how to get Christmas-minded shoppers into their store and show them a good time. We salute the commitment at Fountains of Wayne to continue this long-standing tradition, a real surprise at the tail end of our Sopranos day tour -- and in contrast to the dolls of another kind that we saw at the Bada Bing (a.k.a. Satin Dolls) in Lodi. Route 46 westbound side on the right before the overpass.